Many organizations require almost continuous availability of their mission-critical, IBM® FileNet® P8 systems. Loss of system resources and services can translate directly into lost revenue and lost customers. The goal, therefore, is to design and implement IBM FileNet P8 systems that are highly available by compensating for both planned and unplanned system outages and eliminating single points of failure. IBM FileNet P8 Platform provides availability features that are built-in to the core components. With these features, high availability of an IBM FileNet P8 system can be achieved through redundancy: redundant components, redundant systems, and redundant data. Hardware and software components might fail. With redundancy, the failure can be eliminated or minimized. 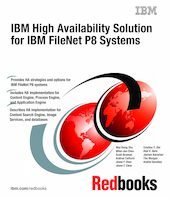 This IBM Redbooks® publication describes strategies and options for core IBM FileNet P8 system components. In addition, the book provides detailed, step-by-step procedures that we used to implement high availability for our case study IBM FileNet P8 system. This book serves as a practical reference when you design and implement highly available IBM FileNet P8 systems. This book is intended for IT architects, IT specialists, project managers, and decision makers identifying the best high availability strategies and integrating them into the IBM FileNet P8 system design process.